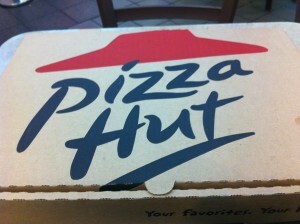 Take, for example, the Middle East, where Pizza Hut unleashed the Cheeseburger Pizza earlier this year. 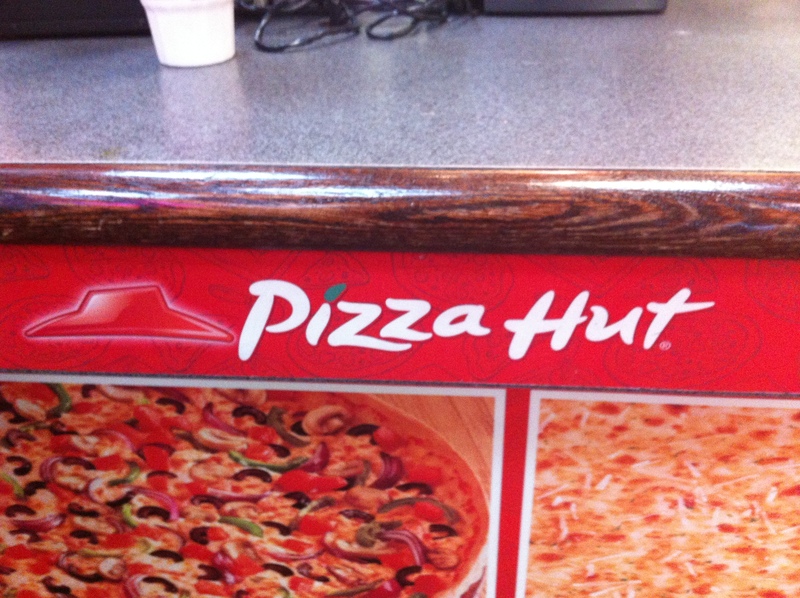 I know it sounds innocuous enough, but no… it’s not a pizza with cheeseburger pieces on top. 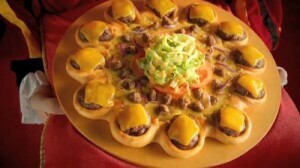 Instead, it’s a pizza RINGED with mini-cheeseburgers in the crust! Now while I couldn’t make my way out to the Middle East to try this delicacy (which wouldn’t really appeal to me anyway — too much cheese), I did get to try their new offering here at home… the Garlic Bread Pizza. Like the Cheeseburger Pizza, the Garlic Bread Pizza sounds like something a bored college student would put together after a late night of drinking heavily. Unlike the Cheeseburger Pizza, however, this one sounded rather palatable to me anyway and like it could be a good idea, so I decided to go give it a try. As advertised, the pizza costs $9.99 and comes with one topping. I don’t normally do toppings, but since it was included I went with pepperoni. Unfortunately, since Pizza Hut is a Pepsi establishment, I had to go without a drink. When the pizza arrived, I was pleasantly surprised by the very mild smell of garlic. I almost expected it to be overwhelming, but the smell was just right. A good start. The pizza looked so delicious that I had to consciously resist the urge to dive right in and, most likely, singe the roof of my mouth. This gave me some time to inspect the whole kit-and-kaboodle. The pizza itself is exactly as advertised. 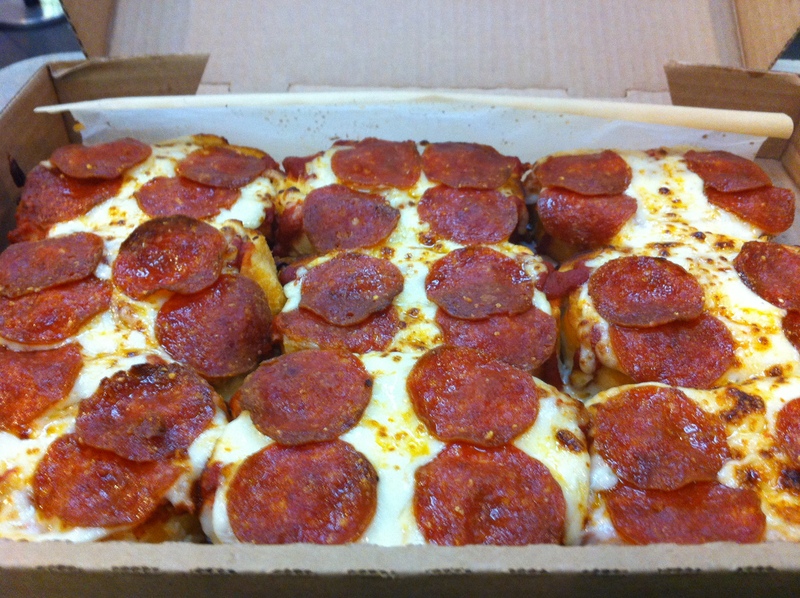 It’s nine slices of Italian/garlic bread with the pizza toppings right on. I don’t know if this was just the way mine was prepared, but each slice had the same number of pepperoni slices on it (4), guaranteeing that each piece would be as good or as bad as the others. The pepperoni was sliced thin. This is important because it allows you to actually bite through the pepperoni instead of having to tear it off the pizza, getting more in your mouth than you bargained for. The first bite of the pizza had the unmistakable flavor of garlic bread. The bread itself was soft, not as crispy as garlic breads tend to be. This made eating it a lot easier and, like the pepperoni thickness, meant that you could eat it easily without fighting to not make a mess. Despite how the pizza looked when I first saw it (a mountain of cheese and pepperoni), there was actually a decent amount of sauce on the pizza as well. 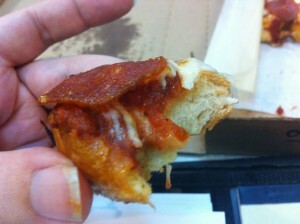 A thicker sauce than you find at most pizzerias, it was nice and sweet and mixed well with the garlic and pepperoni. I do wonder, however, if the pepperoni (or other toppings) are what really make this pizza work. Every once in a while I would hit a pocket of more concentrated garlic. This was mitigated by the flavors of the pepperoni (again, present in every bite). If not for the pepperoni, I’m left to wonder if the garlic would be too overpowering. All-in-all, the pizza was very tasty. I loved the combination of ingredients and the care with which it was prepared. I did actually get to witness some of the preparation so I do know that this doesn’t come out of a freezer pre-made. It was made with a level of care that I wish everyone shared. For $10 it will make you feel like you’re in college again. And that’s just the right price. 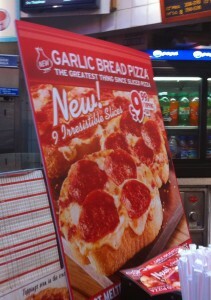 Try the Garlic Bread Pizza now at your local Pizza Hut. It should feed 2-3 people per pie, depending on your appetite. The Desert of Souls : Adventure in the 1,001 Nights Tradition!